Map of Silvenar Vale circa 2E 582. The Silvenar Vale is the northernmost region of the Malabal Tor region, closer inland to the Colovian West than the rest of Malabal Tor. The region is long, beginning towards the Strid River, all the way to the Xylo River Basin. The region is named after the regional capital, the city-state of Silvenar, which serves as the seat of power for the Silvenar. 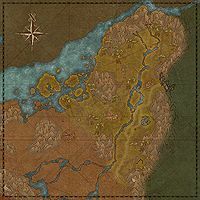 Most Bosmeri settlements exist the area ranging from Valeguard and the landmark known as Ouze. The Baandari Clan township called the Baandari Trading Post is on the border of the Reaper's March, which is evident with the Colovian architecture in the Trading Post. This page was last modified on 7 December 2017, at 01:17.